Brantford police officers Sgt. Raj Saini and Const. Kari Drake decided to go back to school to achieve a personal goal. 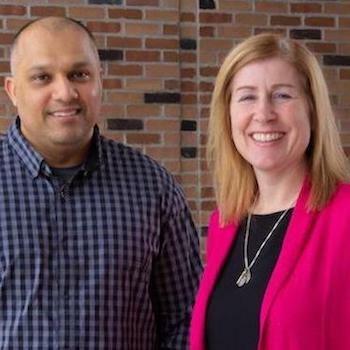 The officers are only part way through the online Master of Public Safety program offered through Wilfrid Laurier University’s Faculty of Human and Social Sciences, but they have already seen a shift in their perspectives at work. The Master of Public Safety program is designed to create graduates who can lead, assess, improve and shape the future of public safety. It is the first program of its kind in Canada and is the only program to align with the initiatives of public safety in the Canadian context. Saini has been a police officer for 20 years. He previously obtained a degree in psychology and sociology and always wanted to return to school to get his master’s. For Drake, who has worked with Brantford Police Service for 14 years, obtaining a master’s degree aligns with her personal goal of pursuing education on an ongoing basis. While working through the course, she has seen a change in her perspectives as a police officer. “We’re looked at as professionals in the community. For me, this program allows me to have a better understanding and knowledge of the diversity of the community we are serving,” said Drake. The online nature of the program allows Drake the flexibility to continue her education while working. Saini sees the flexibility of the course work as an asset. He can complete his assignments on his own time between shifts, and strike a balance that allows for work, studies and family life. Both students are working towards bettering their capabilities and knowledge as members of the Brantford Police Service, something Brantford Police Chief Geoff Nelson values in his officers. Laurier offers other online programs including Honours Bachelor of Arts in Policing, Master of Social Work and Master of Computer Science as well as many online courses. To learn more visit: laurierpublicsafety.ca.